Severe weather is likely today in parts of Kansas and Nebraska. 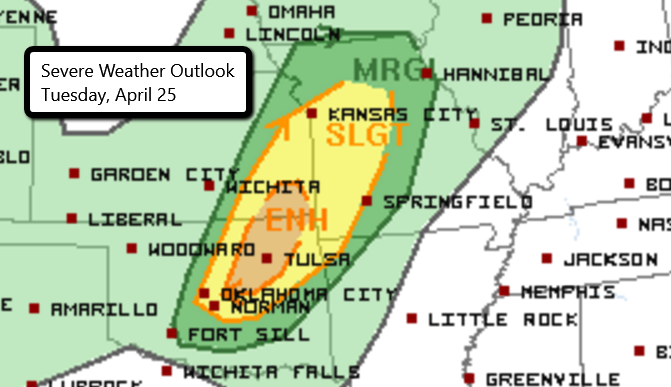 Tulsa, Broken Arrow, and Bartlesville in Oklahoma are in an Enhanced Risk while Oklahoma City, OK, Kansas City, MO, and Overland Park, KS are in a Slight Risk. 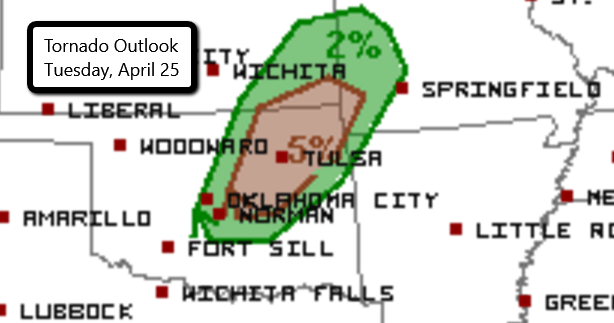 Large hail, damaging wind gusts, and a few tornadoes are possible. Storms are expected to develop this evening and continue into the overnight hours. If you live in these areas, be sure you have a way to receive severe weather alerts even if you are sleeping! Strong storms will continue to be a threat tomorrow from parts of the Great Lakes to the Gulf. There is an Enhanced Risk from extreme north Louisiana into Missouri, including Little Rock, Jonesboro, and Pine Bluff in Arkansas. Surrounding areas from central Illinois into east Texas and Louisiana are in a Slight Risk. 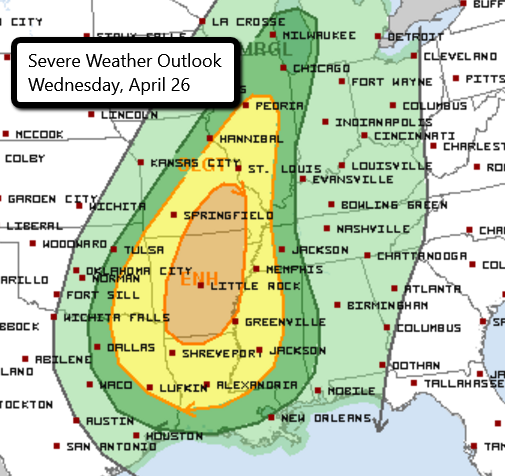 This includes Memphis, TN, St. Louis, MO, Shreveport, LA, and Jackson, MS. Large hail, damaging wind gusts, and even a few tornadoes will be possible in these areas. Follow us on Twitter for updates as storms begin to develop. Watch live chaser streams here!